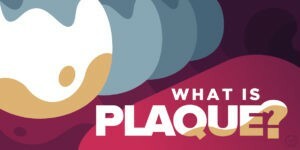 Dental Health, General & Preventive Dentistry : What is plaque? Plaque is a sticky, colorless film of bacteria that lives on the surface of your teeth and along the gumline. It accumulates from normal daily activities such as eating and drinking, especially if you’ve been consuming a lot of sugars and starches. You can schedule your appointment by calling us at 443-249-8854 (current patients), 443-249-8881 (new patients), or by requesting an appointment online.